Students and faculty march on Library Walk during the Nationwide Adjunct Walkout and Day of Action to demand higher wages and better job security for part-time professors. Photo by Vivian Luong/ UCSD Guardian. Members of the UCSD community rallied in solidarity with the Nationwide Adjunct Walkout and Day of Action in front of Geisel Library on Feb 25. The rally participants protested for higher pay and better job security for the increasing number of adjuncts — temporary, part-time professors — at colleges. According to Larissa Dorman, an adjunct professor at San Diego City College, 75 percent of college faculty in California work part time. Dorman also said that many adjuncts, including herself, work at several different campuses. She made $36,000 teaching six classes last semester but could have made twice as much if she had been working full time and teaching five classes. Latin American Studies graduate student at UCSD Daniel Gutierrez expressed to Public News Service his frustration that he can’t use adjunct professors for his research committees even though they know his work the best. 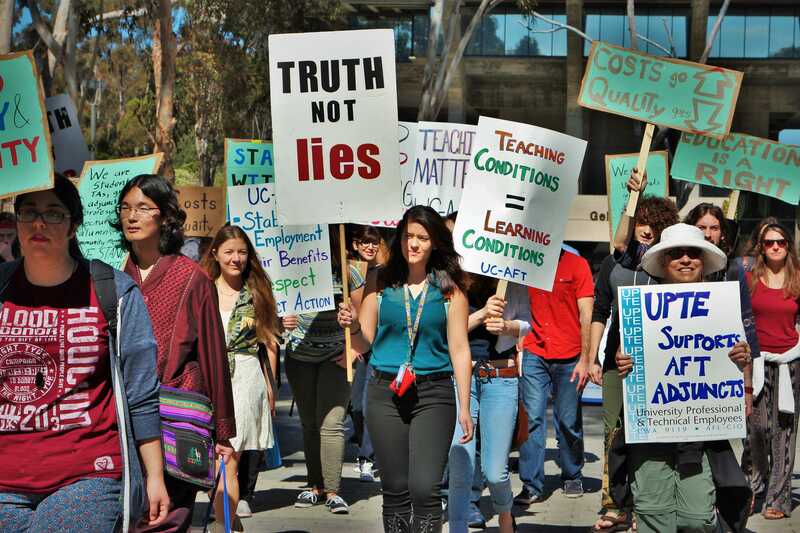 After the protest, which commenced at noon, University Council-American Federation of Teachers hosted a teach-in titled “Toward a Democratic University” at the Yosemite Room in Earl Warren College. In addition to the adjunct issues, the participants discussed topics related to the University of California system, such as neoliberalism, race and community. Gutierrez, who was also one of the panel members at the teach-in, told the UCSD Guardian that the rally was not only about the adjunct issue but also the series of interrelated problems connected to it. Gutierrez also informed the Guardian that he is a member of UCSD’s General Assembly — an organization that examines and attempts to formulate responses to these issues — and currently are primarily focused on the goal of outreach. When asked about a potential statewide student walkout on March 5 that one of the rally members mentioned at the teach-in, Gutierrez said that the GA is holding off on an attempt to organize a corresponding movement at UCSD. “Right now, we have to probe whether the school’s ready for that and if there are social bases that can be mobilized by then,” Gutierrez said. During the protest, Geisel Library hosted an unassociated panel in the Seuss Room titled “Activism, Policing and Black Lives Matter,” in which professors examined the roots of injustice and proposed ways of creating a sustained movement to fight them. Panelists included UCSD Communication Professor Zeinabu Davis, Associate Ethnic Studies Professor Dayo Gore and Associate History Professor Daniel Widener, as well as Cal State San Marcos Sociology Professor Cesar Rodriguez.